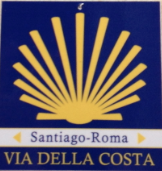 Ligueglietta is crossed by the way “Via della Costa” which connects a spiritual path between Rome and Santiago de Compostela (Spain). Casa Vacanze Oliveto welcomes pilgrims with credential to sleep in one of the Holiday apartments which is located in directly on the path (via San Rocco 72). The price per person and per night is 25,00 Euro (maximum one night accordingly to availability). This apartment (Pilgrim Hostel) dispose of Internet WiFi, a kitchen, washing machine and centralized heating. A towel, a bed sheet and a blanket will be given to each pilgrim. The apartment can host up to 7 pilgrims. “In search of himself: a path, the Cross for the Infinite.” After five years’ search and checks on the territory, we have fullfilled our dream, that is a route linking the two great places of pilgrimage, Santiago de Compostela and Rome, by covering on foot and on days off the stretch Ponte St. Ludovico – Sarzana. Moreover, since our Liguria is heavily built and tarred, we have looked for paths and communications not far from the coast alternative to the Via Aurelia. Ancient stretches of the Roman Way, sometime tarred sometimes cobbled, have been rediscovered. Medieval paths, ” crose” a typical little road in Liguria in the half of two walls among modern buildings, routes in greenery have given the chance to rediscover and live in a country which can still give strong emotions because of its scenery and the charme of its ancient villages. The deep spririt of this land can be caught in the lights, the perfumes, the art and work of our ancestors, all of which are preparatory elements to the aim of being a pilgrim. We have not achieved this goal by ourselves, that is why we are gratefull to Franca Remotti from San Remo, our friends Rita and Italo Graziano, Alain Le Stir, Paolo Pometto, Guido Piccon, Giorgio Giacobbe, Matteo Tomatis, Claudia Barbieri, Gianni Odasso Vito Clarisio, Paolo Revelli, Anna Bonavera and Francesco Rocchi for their help and encouragement, Sandro Abbo for historical research, St. James Brotherhaod from Perugia for their first push and acknowledgement of the route in the province of Imperia. In addition, our gratefull thanks to the province of Imperia and Ms. Sonia Zanella who has marked the Imperia stretch and last but not least, to all the reception points for their collaboration and confidence in this project. Our hope is that this activity will arouse Ligurian authorities sensitivitiy to follow the exsample of the Imperia province by completing the marking of the route in the whole region. Questa voce è stata pubblicata in Via della Costa. Contrassegna il permalink.